It’s been a while in since the project started in Copenhagen, and it is perhaps a good time to summarize the adventure so far. Spending almost two month in Copenhagen, Denmark, is enough time to get a good impression of what the city is like. This post can be considered as our tribute to all of you, who also posted nice scenery pictures and described a bit about your locations (sort of like a lonely planet guide). If someone asked me to describe Denmark, or Copenhagen to be specific, the best choice would be kind. Everything is so calm, even for a capital city during the summer months. The habits of the local Danish people can be admired for their preservation of the environment and surroundings. Even organic food can sometimes cost less than ordinary produce. A statement which is very well proven by the Danish people. To us, the fact that after only 3-4 weeks, you already feel like a native, means a lot in the way of how easy going it is in Denmark. Everyone speaks English very well, so it makes the task of learning Danish almost unnecessary. That could be a miss, since it is the language spoken by local people with its own tradition. For a foreigner it could be hard at first, especially since they don’t pronouncing ‘d’ in words. An interesting note about Denmark: the country possesses the oldest known flag (Dannebrog), dating back to the 13th century. For someone who came from a sunny (and hot) country like Israel, I didn’t fully understood why everyone is so happy when the sun came out. In fact, having temperatures of 15-20 Celsius during summer couldn’t be better. Like a bottle of wine at the perfect temperature. However, soon we figured out that the weather can change quite dramatically, from sunny to cloudy and even raining quite heavily. Apparently, sunny days are not that common in this part of the world and during winter, temperatures can drop significantly, so much so that the sun doesn’t really rise above the buildings’ tops. 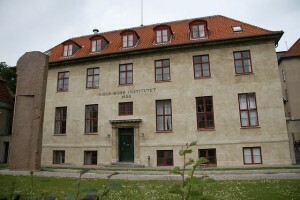 While staying in Copenhagen, The Niels Bohr Institute was really our house during the program. In the world of physics, the name Niels Bohr means a lot, although as a young generation it is mostly a historical note, for the people who created the groundwork for quantum physics as we know today. We were hosted by the eScience group, composed of researchers in computer science that develop tools to aid scientific communities exploit parallel processing power easier than before (a group picture at the bottom). Several weeks ago we had a chance to visit eastern Denmark, close to Sweden. After questioning some local friends for sightseeing recommendations, we ended in North Sealand, an area located about 40 minutes away by train from Copenhagen. If anyone Danish tells you there is nothing to see in Denmark, suspect that it was after drinking some strong beers. It might not have Fjords like Norway, and offer only flat surfaces, but there is a lot to explore, especially if you go out of the city to more rural areas. So after some planning, Lukas and I decided to visit Helsingør (for non natives, it is more familiar as Ellsinore). It’s a harbor city, with ferries that depart to Sweden (4 km away) frequently. Like any good harbor city, you cannot expect anything to happen early in the morning (if you consider 10am early), so we used that spare time to walk around, take some pictures, and buy tickets to the Kronborg castle. And this is the point where Shakespeare (The real Shakespeare) make an appearance, as this castle was used in the story of Hamlet. It is an interesting place to visit and become familiar with the local history and it also offers a nice view of the ocean and Sweden. If you’ll have time, better buy a full ticket and follow the guided tour to hear all the stories it has to offer. For us, learning about the kings of Denmark and its history was very interesting and enriching. 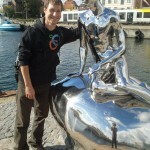 Helsingør – Lukas and the little mermaid. Me on the reflection. While walking there, we noticed a small statue of a merman. 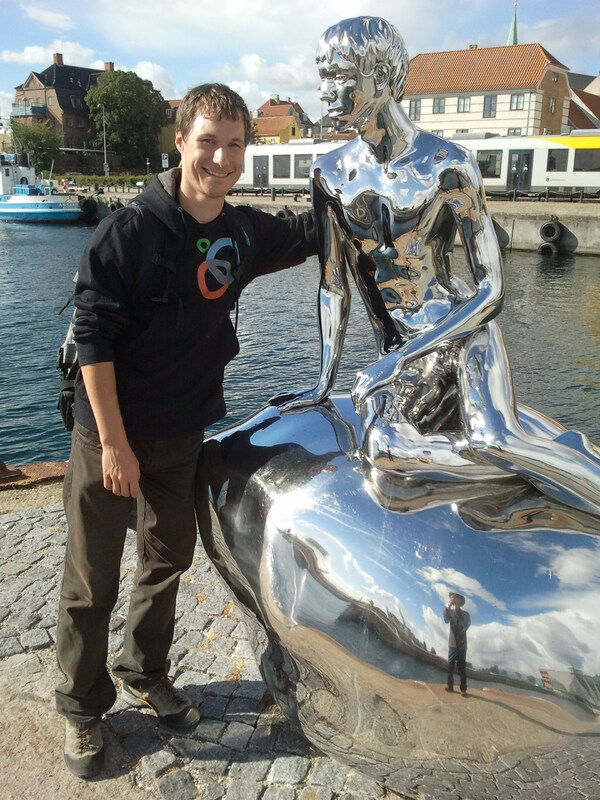 Probably the counterpart of the famous Little Mermaid in Copenhagen. We were tempted to catch a ferry and go to Sweden, it would have been the first time for both of us. It was a matter of 57 DKK and 4 km of sailing. But the weather started to change for the worse and we had our bikes with us, in any case. It seems like visiting 4 countries in one summer was a bit too much to accomplish. But on the positive side, it gives a reason to return to Denmark. To make our time more efficient, we planned the rest of the day. Helsingør has a very good tourist office, right nearby the main train station. It offers a lot of information about possible tours in the North Sealand area and maps for free, with marked tracks. Not to mention that the service is also very pleasant via email. There is no chance of getting out without information or valuable suggestions. Luckily, we found a place to rent professional mountain bikes and make a short trip inland on some marked nature trails. It was a good chance to visit towns and to see some of the nature Denmark has to offer. Greetings to everyone and to Jasper Kursk, the winner of the 1st k-means quiz. Both of us really enjoyed Denmark and Copenhagen, thanks to the local group at NBI and the Danish people, as well. Hopefully we could plan a future visit, since there is a lot more to do and see. If any of the Danish people are looking for a lot of sun for free, I humbly offer an invitation to visit Israel (many Norwegians and Swedish do visit). Especially during winter, you will soon find out that it is similar to your summer, with the exception that even then we have more sun than expected. Just leave a message and consider yourself as welcome guests. The eScience group at NBI and us. 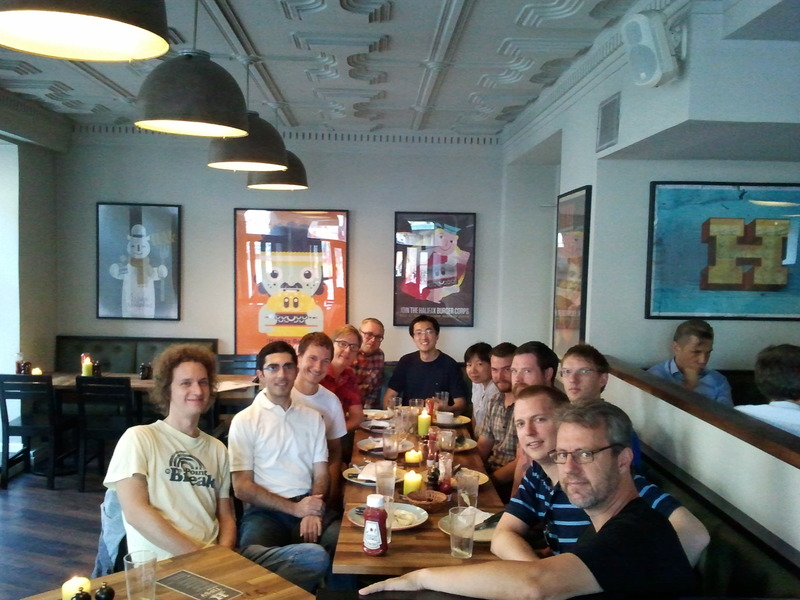 From the bottom-right corner and around the table: Prof. Brian Vinter, Dr. Mads Ruben Burgdorff Kristensen, PhD student Lukas Wirz, PhD student Troels Blum, Master student Morten Rasmussen, PhD student Yan Wang, PhD student Weifeng Liu, Dr. Kenneth Skovhede, Dr. James Emil Avery, Lukas, me, Master student Benjamin. Missing: Simon Andreas Frimann Lund (Ph.D. student and the NBI Cluster Super-Hero). We owe special thanks to Mads, our project mentor, and Brian, our site coordinator for guiding us through and the SoHPC team for making this summer really great. And finally, to Lukas, it was a pleasure.